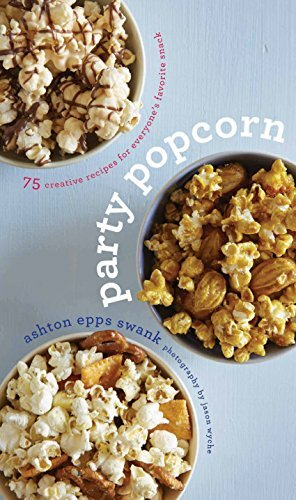 What’s Your Favorite Popcorn Recipe? 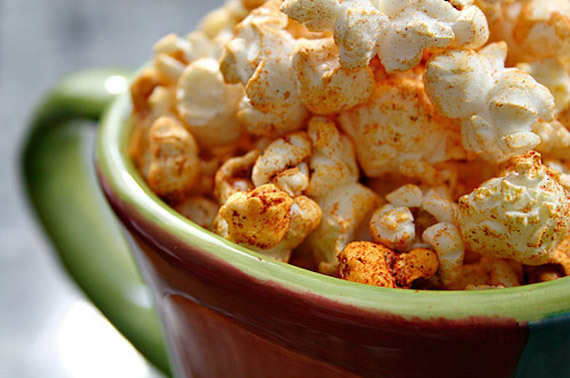 More great popcorn recipes here! We all like to watch a movie every now and then. Be it on the big screen, in your home cinema system or under the covers on your phone at one in the morning. For some people it’s a typical Friday night and to some it’s a nightly ritual but to all it means one thing, popcorn! Everyone has their own tastes and flavors but it’s hard to find a good healthy popcorn recipe. It’s always coated in butter and salt which we all know is not exactly good to have every night. Whether you own a popcorn popper or use the stove or microwave, we can help you make your movie snack really POP! Here we are going to walk you through our top 5 homemade popcorn recipes which are as good as they are healthy! A quick note before we begin, we have to start with the basics. 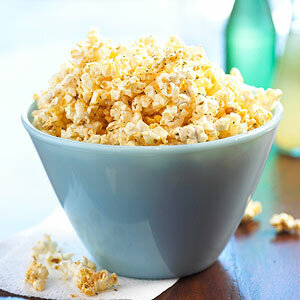 We all know popcorn as the small fluffy crunch but before it becomes that delicious white bite, it’s a kernel which is anything but delicious. What it needs is moisture and without enough moisture, there will be far too many unpopped kernels. This is a good sign of dried out popcorn. The best way to keep popcorn fresh is to keep it at room temperature in an airtight container. Make sure to use it within six months though or they may no longer be good. If it is kept somewhere too cold such as a refrigerator then they can dry out. If your popcorn is a little on the dry side then try dropping the kernels into a jar with about a tablespoon of water, replace the lid and then try vigorously shaking for a few minutes and draining. Dry them on some kitchen paper and drop them into a preheated popper. If all goes to plan then they should have absorbed some of the moisture and be much more ready to pop! 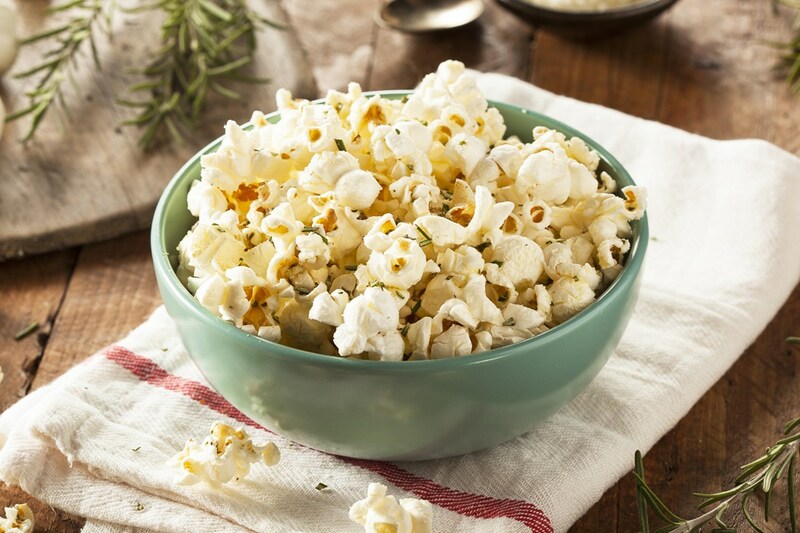 We are going to start off with a Thyme and Parmesan popcorn seasoning recipe! For best results make sure you use a proper Parmesan, stamped on the rind Parmigiano-Reggiano which should be available at most supermarkets. Grate it as fine as you can with either a microplane or the smallest holes of a box grater. Mix together the garlic powder, thyme, and a pinch of salt. Pour the hot popcorn into a large serving bowl and sprinkle with the popcorn seasoning. Mix in the finely grated Parmesan as you toss it all together in the large bowl. Next we are moving onto a Greek-Spiced homemade popcorn recipe! This time we are going a little Mediterranean with this underused healthy popcorn recipe. If you want to go the extra mile then go for a nice feta cheese to crumble over the top. For the true Greek experience, goat’s milk feta is a must! This one needs 1tbsp of dried ground lemon peel so be sure to look out for some in the spice aisle of your local market. Mix the dried ground lemon peel, dried dill, onion powder and pinch of salt in a small dish. Drizzle a small amount of olive oil over the popcorn to lightly coat it. Sprinkle the spice mix while tossing the popcorn until fully coated. Finish off with some feta crumbles for a finishing touch! Not surprising to some and yet completely new to others. Good for a party snack or something to gorge on to your favorite action flick! Mix the chili powder, cumin, paprika and garlic powder in a small dish. Toss in a large bowl with the hot popcorn until evenly coated. This spicy popcorn seasoning can be topped off with some crumbled blue cheese to seal the deal! The next one coming up is one for you vegans, lactose intolerant or maybe those just looking for a healthy popcorn recipe we have our Cheeseless Italian popcorn! Nothing beats a delicious cheesy taste but sometimes it can just be too much. Next time you are out shopping try looking for some Nutritional Yeast! It may be a little hard to find but do not let the name fool you, it has all that delicious cheesy taste without having to feel bad! Sprinkle the nutritional yeast, garlic powder and Italian seasoning over the warm popcorn and serve. If the mixture is finding it hard to stick to the popcorn then try spraying it with some nonstick spray. Keep turning until its all well coated. We are closing off with a sweet classic. The cinnamon spiced popcorn seasoning! We have could not have a top 5 healthy popcorn recipe list without having something sweet on here and nothing does it justice as the spicy popcorn flavoring of cinnamon. This one takes a few more ingredients which should not be too hard to find. Put the popcorn into a large serving bowl and spray with a nonstick cooking spray, carefully folding into itself to coat evenly. Continue tossing as you sprinkle the powdered sugar, ground cinnamon, ground nutmeg and ground allspice. 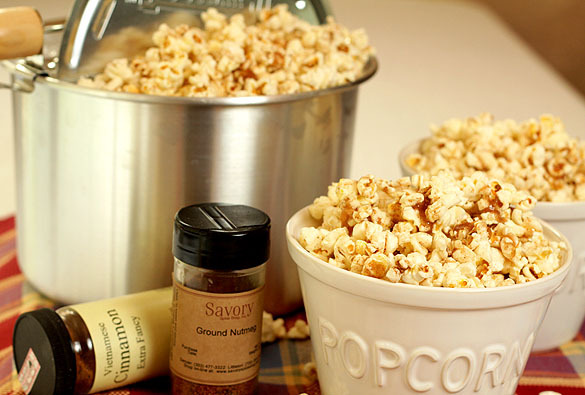 This popcorn seasoning recipe can be made deliciously messy with a light drizzle of honey. Keep the hand wipes at the ready! 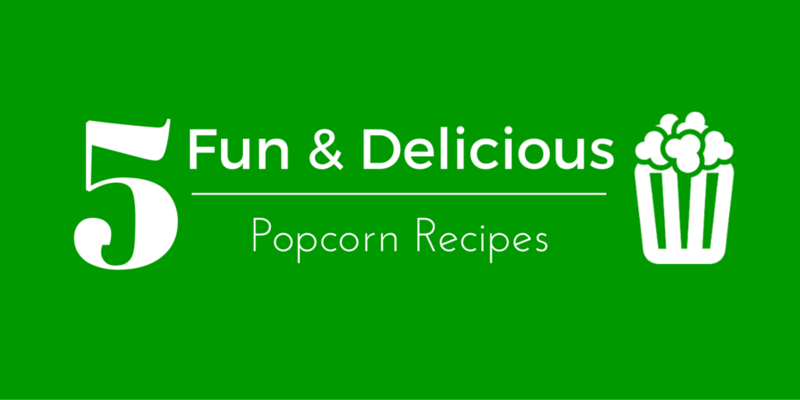 Check out even more great popcorn recipes here! With all of these tasty recipes, it makes you just want to snuggle up on the couch under a big blanket, put on one of the classics or maybe that one film you have been putting off “til next time” and dig into your new flavors of an old classic. It’s that hearty comfort food feeling, it’s a great way to feel at happy and at home. When you have all these healthy popcorn recipes, it has never been easier to eat these tasty treats whilst still keeping control of your munchies! 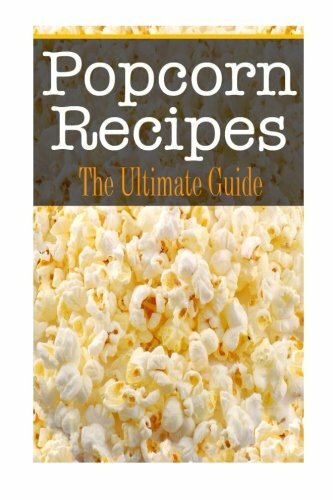 Try making some of your own homemade popcorn recipes and show all the friends how movie night does not have to be bland to be healthy or unhealthy to be enjoyable! You’ll love the look on their faces when you tell them it isn’t that bad after all. You will be surprised at what combinations go together!